Edited by John Caserta and Lynnette Widder, this architectural monograph documents houses and public buildings designed from 1944 to 1964 in an otherwise traditionalist part of New England by this RISD and GSD-trained protagonist of Modern Architecture. 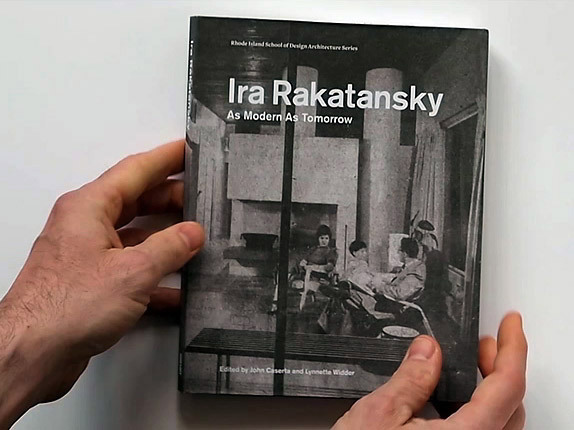 Rakatansky's work represents the skillful adaptation of an originally European Modernism to American conditions and culture, within a client base that was new to architectural patronage. During the period in question, he was the only practitioner consistently committed to Modernism in the Providence area. The 6.8"x8.5" soft-cover book is 208 pages with 70 color photographs and more than 100 black and white photographs and drawings. Essays by renown historian Joan Ockman and co-editor Lynnette Widder (RISD Architecture) with contemporary photographs by Thad Russell (RISD photo) and John Caserta (RISD Graphic Design). The Design Office provided image archiving, and donated use of its scanner and printers for book and photographic proofing.